Experience South America's amazing diversity, from a private wine sampling in Chile to Argentina's Alpine "Little Switzerland," Bariloche, as well as on visits to mighty Iguazu Falls and vibrant Buenos Aires. No reviews yet for this trip. Browse other reviews below for Abercrombie & Kent. Just sitting in the Nairobi airport after an amazing A&K Safari in Kenya and Tanzania. This experience far exceeded my expectations. The guides were warm, knowledgable, and passionate. and Frankly I teared up a bit when saying goodbye to our Kenya guide, Peter, before heading to the airport. Dr Cornelius, our Tanzania guide, is a veterinarian - he knows the animals outside AND in (he's treated giraffes!). Every hotel was filled with friendly staff. Ever day was filled with surprises. We saw over 10 days seven leopards AND a rhino - some of the most elusive animals. We saw baby hyenas from a few yards away playing. We saw a lion carrying her cub in we mouth. The list goes on. Our guides were diligent and determined to find what we hoped to see. A&K makes this experience even better - you really don't have to think about anything except what time we are leaving in the morning or meeting for dinner at night. Customer service at its best - they live up to their reputation! Words cannot describe the level of service provided by A&K. I just returned from my trip to South Africa and Zimbabwe, and it was truly a trip of a lifetime. Every single detail was executed with perfection. The pre-trip documentation was superb, the guides/drivers in each location were so knowledgable and professional, and our accommodations as well as the service provided at the accommodations was beyond First Class. Most of all, our guide was remarkable! Ananda van der Merwe was with us from start to finish, and she made our whole journey even more perfect than we could have ever imagined. She was so attentive, professional, knowledgeable, sweet, caring, thoughtful, patient, accommodating, smart, funny, and MORE!! Anyone traveling to South Africa should request that Ananda be their guide. You will not regret it! Thank you for an incredible vacation. It was utter perfection from the moment we booked the trip to the moment we arrived back home. Exceeded expectation in hotels, logistics and advice on what to see when on holiday. The guides were excellent and very helpful. We took a trip to Jordan and Oman planned through our travel councillor and A&K. We chose this upmarket company and certainly had an upmarket holiday. Everything was top notch from beginning to end. We saw all the amazing sights, were given excellent tour guides and the accommodation was 5 star all the way. They included a couple of unusual accommodation choices too such as a rather posh tent in the desert and an Eco tent at the turtle reserve in Oman. Would fully recommend this whole tour and A&K. Recently had a holiday booked with Abercrombie and Kent which was so disappointing we left 5 days early and the rest of the family left 3 days early. The way that A&K dealt with the situation and with us as guests was unprofessional and the property manager we dealt with on site was rude and antagonising. We have had numerous holidays with A&K before and never have we had an experience like this. It has been constant excuses and no apologies. We will never travel with them again and have advised our extended family, friends and industry contacts to do the same. Arrive in Santiago, the charming capital city of Chile, where you are met by an A&K representative and transferred to your hotel, and enjoy a guaranteed early check-in. This afternoon, remain at leisure to relax or explore the city on your own. At 6:00 p.m., gather for a welcome briefing led by your A&K Resident Tour Director. Afterward, enjoy dinner at the hotel’s elegant Estró Restaurant. This morning, embark on a city tour that offers a complete look at Santiago’s most important areas along with beautiful panoramic views. Drive to the Mercado Central to view this colorful local marketplace before taking a short walk to Plaza de Armas, the city’s most famous square. Gaze at the beautiful surrounding buildings, including the impressive Metropolitan Cathedral. Nearby, enjoy a tour of the Museum of Pre-Columbian Art. Next, depart the city for a look at the local wine district, viewing Palacio de La Moneda, seat of the President of the Republic of Chile, along the way. Chilean wines have come to prominence in recent years, owing to their exceptional character. This results from several factors, including the ideal combination of sunny days, cool nights and excellent soil in Chile’s long Central Valley. Visit an acclaimed family-owned winery for a private sampling, and to learn about Chilean cuisine during a Chef’s Table experience. After lunch, return to your luxurious hotel where your evening is at leisure. After an early breakfast, fly to Puerto Montt, gateway to the gorgeous Chilean Lakes District. Journey overland to Frutillar, a charming village established by Chile’s first German settlers. Observe how their influence remains in the gardens and architecture, and enjoy breathtaking views of Osorno Volcano. Tour the German Colonial Museum with its exhibition of a settler’s house and possessions dating to the 1850s. Next, transfer to Puerto Varas, a town that also exemplifies the German influence in this part of Chile, with its architecture reminiscent of the Black Forest. After a light lunch at a local restaurant, continue to Vicente Pérez Rosales National Park to visit Petrohué Falls and view its aquamarine rapids. Later, arrive at your hotel on the shores of Lake Llanquihue overlooking Volcano Osorno. Enjoy dinner at the superb hotel restaurant. Travel to Pargua Bay, where you Ride Like a Local by ferry boat to San Antonio de Chacao, a colorful village on Chiloé Island, settled by the Spanish in 1565. Proceed to Puñihuil, a fishing village with a beautiful beach for watching Magellanic and Humboldt penguins as well as a wide variety of sea birds and marine mammals, such as dolphins and sea otters, as they cavort around four islets that form a national monument. Enjoy a lunch of delightful regional dishes at a local restaurant before returning to Puerto Varas. Begin your full-day journey through the Lake District, rewarded by panoramic views of deep blue mountain lakes, snow-capped volcanoes and ancient forests. 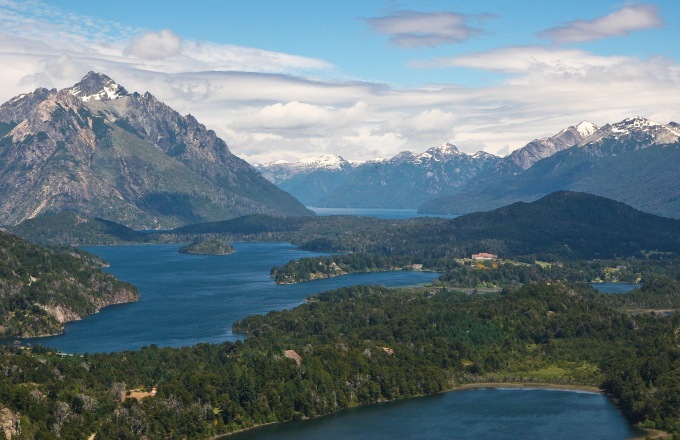 Embark on a private cruise on Lake Nahuel Huapi and sail through its captivating scenery. Stop at Victoria Island, part of Nahuel Huapi National Park, for a walk in a Patagonian paradise. The island is home to the petite pudú deer — inspiration for Walt Disney’s Bambi. Arrive in picturesque Bariloche for a delightful two-night stay. Today, tour the postcard-perfect Alpine region many call “Little Switzerland.” Hike the surrounding scenic woodlands, and then visit a local brewery. Meet the brewmeister and enjoy a tasting on a memorable Artisan Visit. This afternoon, drive to Playa Serena to toast the sunset on a Scenic Sundowner with your A&K Resident Tour Director. Fly to Iguazu Falls and visit them on the Argentine side. Bordering Brazil and Argentina, the falls are one of the most impressive sights in the world, with a breathtaking 275 cascades spread across a gulf of nearly two miles. Board a train shuttle to the Cataratas Station where you disembark to walk paths that lead along and above the spectacular falls. Beautiful flowers, ferns, tropical plants, butterflies and exotic birds add to the Throat,” where you walk onto a catwalk that extends 1,300 yards over the lush tropical basin of Devil’s Gorge. Dine at your hotel this evening. Today, explore the Brazilian side of the falls, walking with your guide through the National Park of Iguazu to experience the incredible power of millions of barrels of falling water, as you move within arm’s length of the rumbling cataracts. This spectacular natural wonder, which was formed by a volcano, is comprised of 275 separate cascades spilling over a basalt cap nearly two miles across. Climb a wooden staircase 115 feet to see the falls from the top, watching rainbows form and fade in the sunlit spray. After a leisurely breakfast, fly to Buenos Aires, Argentina’s remarkable capital, and check in to your hotel. This afternoon, set out on a walking tour of this decidedly European-style city, and later experience a private tango demonstration and lesson from performers at the famed Rojo Tango. Tonight, enjoy a thrilling, exclusive tango show performance and dinner at the Rojo Tango cabaret. Get caught up in the passion, precision and glamour of these renowned professional dancers, as they perform to the accompaniment of a live orchestra, and dine on traditional Argentine dishes paired with select local wines. Explore cosmopolitan Buenos Aires on a city tour that includes the beautiful parks of Palermo, the old quarters of San Telmo, the colorful La Boca district with La Bombonera, as well as some landmarks connected to the “Peronismo” legacy. After a light lunch at a traditional local café, visit the fascinating Recoleta Cemetery, gravesite of Eva Perón, Argentina’s beloved and controversial former First Lady. Tonight, gather for your festive farewell dinner. Visit the beautiful Teatro Colón, an opera house world renowned for its acoustics. Stop for lunch, and then take advantage of a late checkout on your final afternoon here, before your evening airport transfer and your flight home or on to vibrant Rio de Janeiro. First group event: welcome briefing at 6:00 p.m. on Day 1. Last group event: end of sightseeing at 2:00 p.m. on Day 11. Extend Your Journey | Enhance your journey with a pre-tour extension to Machu Picchu (5 days, from $2,795) and a post-tour extension to Rio de Janeiro (4 days, from $2,495). Fly to Cusco and transfer to your beautiful 15th-century hotel, a former monastery. This afternoon, explore the city of Cusco and tour Sacsayhuaman, a marvel constructed of immense stones that speaks to the ingenuity of Incan builders. Enjoy a welcome dinner. Travel by Vistadome train to Machu Picchu, the mysterious “Lost City of the Incas” rediscovered by American explorer Hiram Bingham in 1911. Explore its sprawling ruins, including the Temple of the Sun. Return to Cusco by train. Explore Cusco during a day at leisure before joining your fellow travellers for an elegant dinner at MAP Café. Fly via Lima to Santiago, Chile. Arrive in sunny, vibrant Rio de Janeiro, Brazil, and transfer to your iconic beach hotel. Visit Rio’s Christ the Redeemer statue, followed by a Brazilian lunch. Stop at the Sambodromo, and then attend a private percussion workshop. On Day 3, ride a cable car up Sugar Loaf for inspiring views. Gather for a farewell dinner. See historic Rio by Metro before departing. Take This Journey Private | This itinerary is also available as an independent journey, Signature Chile & Argentina, with A&K local guides. Customize This Journey | If you would like to customize this itinerary and create a Tailor Made Journey just for you and your companions, click here to inquire, or speak to your travel professional.